The following is the full text of a wide-ranging address on Thursday October 25th by Sinn Féin PresidentView image. I am very happy to open this new Sinn Féin office in Trim which is yet further tangible evidence of the growing size, and relevance of Sinn Féin in communities across this state. I want to commend republicans in County Meath for all your hard work of recent years and the contribution you have made to the growth of the party and to some of our stalwarts who have been with us in good times and in bad times. A special word of thanks to Peadar Toibin, who is an exemplary and effective TD. On Saturday I will open a new Sinn Féin office in Derry. Further evidence of the all-Ireland nature of our party. The past couple of years have been very important ones for Sinn Féin. This period has witnessed our most successful general election in the 26 Counties, our first involvement in a Presidential election, the completion of the first successful term of the Assembly and the Executive with Sinn Féin in partnership government with unionists, a solid performance in the Assembly elections and a significant growth in party membership, particularly in this part of Ireland. Following the General Election Sinn Féin entered Leinster House with a greatly strengthened team. During our first 12 months in the Dáil, the performance and sheer activity of our team established Sinn Féin as the most effective voice of opposition to this government’s continued implementation of the disastrous austerity policies of Fianna Fáil. Sinn Féin refused to be an opposition in the mould of Fine Gael and Labour. Those parties did not provide the type of effective opposition between 1997 and 2011 that could have stemmed the worst excesses of the Fianna Fáil-led administration. Instead Fine Gael and Labour were part of the problem. And in this Dáil Fianna Fáil is incapable of providing credible opposition. To do that means you have to be opposed to what the government is implementing. Sinn Féin’s political message has been clear, coherent and consistent. It is about protecting public services and families on low and middle incomes, for fair taxes, investing in jobs, a write-down on bank debt and growing the all-Ireland economy. 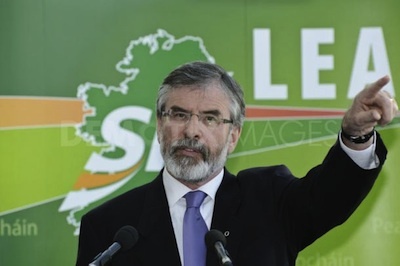 Sinn Féin is also an all-island party – a United Ireland party. Others talk about republicanism but have no vision for the future. Sinn Féin’s approach is rooted in our core republican values and our vision of a new Republic for this island. We believe in citizens and in citizens rights protected in legislation. Partition has failed the people of Ireland, north and south, the unionists and the rest of us. A new agreed Ireland based on the rights of citizens is needed. This is best achieved by unity through reconciliation. This isn’t just an emotional or patriotic or inspirational dream. This is a very hardnosed realisable objective as part of the process of building a new republic. It is worth going back to read Tone. Read Connolly and Pearse. Take a little time and read what Bobby Sands wrote about these big issues. What they all had in common, and Connolly famously talked about the re-conquest of Ireland by the Irish people, is a recognition that we can’t free Ireland. An elite, a vanguard cannot free Ireland. Obviously there is work for a vanguard. The people who take the initiatives; who take the chances; who make the sacrifices; and who go on the political offensive, can create the political conditions for change. But the only true freedom of people is when people shape that for themselves. So this is the big democratic phase of our struggle. It’s also worth reminding ourselves that this isn’t 1798. This isn’t 1916. This isn’t 1981. The men and women of those generations took the core principles of republicanism and modernised them and made them relevant to their own times. That’s what we have to do – we have to take the core values of our political ethos and make them relevant to our time, and in our place of activism, whether that is in the community, in local government, in the Assembly or in the Dáil. Sinn Féin is not about opposition in the Dáil for the sake of it. We are opposed to austerity. We don’t believe you can cut your way out of a recession. It requires jobs and growth and investment. In this Dáil term a major focus for us is on offering realistic, alternative policy positions. This includes the cornerstone of any realistic alternative to austerity — positive proposals for the creation of jobs. Our jobs proposals set out a comprehensive plan for making youth employment a national priority; assisting businesses and manufacturing; developing the agri-food sector; reforming the existing enterprise agencies; promoting co-operatives and much more. Unemployment hurts citizens, drives families into poverty and despair, leads to increased numbers of suicide, the loss of the family home, and social problems for communities. It drives many of our brightest and best young people to flee to Australia and other parts of the globe. For many months in the run up to the launch of these proposals we discussed our ideas with others, including economists, business people and community leaders. Politics is about political choices and in our Jobs Plan Sinn Féin has produced a fully costed, detailed plan that provides a socially responsible way to reduce the budget deficit while creating and retaining jobs. It calls for an investment of €13 billion into job creation and retention, which will create an average of 156,000 short and long term jobs. Next month Sinn Féin will also present our alternative budget proposals. This will also be a realistic and costed set of budget proposal. It will contain practical, effective and innovative proposals to reduce the deficit, create growth in the economy, get people back to work and protect families under financial pressure. Once again it’s about choices – you can either protect the most vulnerable or target them; you can ask those who can afford to pay more by way of a wealth tax to pay more or leave them better off as Fine Gael and Labour did in the last budget. One significant area of concern is the Government’s proposed property tax. This tax is a product of Fianna Fáil’s deal with the Troika. The Government has not mentioned any linking of their proposed tax to the ability of people to pay or to the taxes already paid on the property. Sinn Féin’s wealth tax is a far more equitable proposal which links ability to pay with a percentage tax on all property, physical, material and financial, over €1 million. Our wealth tax allows 20% write-off of the value of the principal residence. It is estimated it could to bring in €800 million in a full year. The Government should abandon its plans for a property tax. As I travel across the state I encounter huge anger that vulnerable people are living with the fear of losing necessary supports while those at the top of the public sector continue to enjoy inflated salaries. Savings have to be made but it is wrong to approach this in a manner that is both unfair and short sighted. The impact of the government’s austerity policies are everywhere. Currently 460,000 citizens are on the live register. That’s over 14%. And government policies are making the situation worse – not better. Thousands of home owners are trapped in negative equity; poverty is increasing and government debt now stands at €169 billion. Fine Gael and Labour have introduced a succession of punitive measures that have reduced wages, child benefit payments, disability payments and social welfare; and attacked social provisions for carers, older citizens, and the blind. Home help hours have been slashed. A recent report revealed that 10% of households suffer from food poverty. That means adults and children not having enough food to eat. Thousands of home owners are trapped in negative equity and mortgage distress. And the credit unions report that over one million adults have less than €50 left over each month after they have paid essential bills. In addition a range of stealth taxes, including the Household charge; the universal social charge; VAT increases; septic tank charges and more, have eaten dramatically into the incomes of families. Some government TDs rail against aspects of the cuts in their local media but when their vote is needed to support the government in the Dáil they back the austerity strategy. This duplicity must also be challenged. The other big issue of the moment is the unsustainable bank debt that is strangling the economy. The Fianna Fáil government borrowed €67 billion from the Troika and gave €64 billion to bad banks. The reality, is that this debt cannot be repaid. The Taoiseach has refused to admit this fact. Some of his Ministers have but he has steadfastly refused to do so. “We will not have “defaulter” written on our foreheads. We will pay our way. We have never looked for a debt write-down”. The Taoiseach moved to reassure the markets and the European Union that Irish citizens, irrespective of the human price and social consequences, would pay the banking debt. How then can the government expect to secure a write down on Legacy Debt if it keeps saying that this state will pay its way? Sinn Féin’s position is to support the government’s efforts but that includes being critical in a constructive way where it is appropriate. The advice we offer is given in good faith. These issues should be above party politics. This is about removing a banking debt that will allow the state to grow its way out of the economic crisis. Our inability to pay the private banking debt gives the government considerable leverage in its EU negotiations. The problem is that thus far it has chosen not to use this. That is a grievous mistake. The government’s approach to constitutional reform is equally under-ambitious and short-sighted. Its proposals for the Constitutional Convention fall far short of the type of reform promised by Labour in particular before entering government. Despite this Sinn Féin is determined to put a number of crucial issues on the agenda at the convention, including voting rights for citizens in the North and for Irish emigrants. On November 10th the Children’s Rights Referendum will be held. Sinn Féin has long campaigned for the rights of the child to be specifically recognised in the constitution. We see this amendment as the first step toward incorporating the UN Convention on the Rights of the Child into Irish law. While the wording in the amendment does not go this far, or as far as Sinn Féin would have liked, it does represent a significant step forward. It expressly recognises children in their own right and affirms in the constitution that children have rights. In particular the best interest of the child principle is established and the voice of the child must be heard in all judicial cases concerning the child’s care, adoption, guardianship, custody and access. Sinn Féin is campaigning for a ‘Yes’ vote and we urge people to turn out in large numbers to use their vote and assert the rights of children in the constitution for the first time. In the North, working with our unionist partners in government, we have managed to mitigate the worst effects of the Tory cuts agenda. As a result, the Executive has prioritised finding money to maintain frontline services, protect those on lowest incomes and communities which were subject to decades of economic discrimination. Even within the confines of the £4bn cut from the block grant, Sinn Féin’s Ministerial team under Martin McGuinness’s leadership, and with the support of Assembly colleagues, have stood against cuts. They have stood up for those who need to be protected from the Tory-driven welfare changes and have sought to use public funds to invest in jobs and growth. The so-called Welfare Reform Bill is another example of the English Tory Agenda. Sinn Féin is opposed to this Bill. Because we are opposed to austerity. We also want the transfer of fiscal power to the Assembly and Executive and a lowering of Corporation Tax. I note that Mícheál Martin on his way to Bodenstown last week suddenly discovered a renewed interest in the North. An informed debate on partition and the north is good for everyone on this island. People might take the Fianna Fáil leader more seriously if he supported the efforts to get fiscal powers transferred to the north’s Executive. Or if Fianna Fáil organised in the north as they have frequently pledged to do. Have you noticed that since Sinn Féin entered the Dáil 18 months ago with increased numbers there has been more talk about the north than in the previous 18 years and more. This evening I would invite all of the parties to the Dáil to organize in the north. I would also invite them to support a border poll. This is a live issue that has been given added impetus by the referendum decision for Scotland. In the Good Friday negotiations Sinn Féin secured the removal of the Government of Ireland Act, under which the British government claimed sovereignty over the north of Ireland. There is now only a qualified, conditional claim that will change when a majority of citizens in the north vote for an end to the union. The Good Friday Agreement therefore provides for a border poll on Irish unity. Sinn Féin wants a border poll. To secure this means building support so that the Irish and British governments are moved to fulfil their obligations to hold one. We will then have to campaign for a YES vote and to persuade the people of the island of Ireland to support unity and the creation of a new Republic. It especially means persuading those, north and south, who don’t want Irish unity that it will be better for them and for their children. It also needs a plan, a strategy. We have to demonstrate in practical ways why working as partners and living together as equals on this island is better politically, practically and economically. I raised this issue with the Taoiseach during Leaders Questions in the Dáil last week. Not surprisingly the Fine Gael leader looked for excuses to do nothing at this time. This is entirely the wrong approach. Now is exactly the right time for a debate on this issue in the context of rebuilding the economies on this island and beginning a process of dialogue and reconciliation. Republicanism on this island has never been so strong, so organized and so capable of achieving its objectives. This generation of republicans is laying the foundations for a New Republic — a 32-County republic with social justice and equality at its core. Our history is replete with challenges, adversity and great injustice. But our people have come through it all. And in every generation brave men and women have come forward. From 1798 to 1847, from 1913 to 1916 to 1981. Visionaries have shown the way. Workers in Vita Cortex in Cork, La Senza, Wilsons, in Game shops around the state, at Irish Cement, Diageo and Lagan Brick have all made a stand. Parents defending their children with disabilities, hospital campaigners, carers, teachers, health workers, defenders of our schools, turf cutters, citizens who are standing up for themselves and their families and communities, are showing the way. So too are citizens who work in the community and voluntary sector, in our sporting organisations, in the arts, in environmental groups, in defence of our language, in support of our young people and our senior citizens. Citizens who are supporting victims of abuse, including drugs and alcohol misuse and suicide prevention, are holding our communities together. These active citizens, compassionate carers and community activists are the real Ireland. We have to stand together, all of us and demand our rights as citizens. Sinn Féin is looking to the future with confidence and vision. I would appeal to even more of our citizens, particularly women and young people to join Sinn Féin and help us build an Irish republic worthy of the name.